Click here to download a pdf of Practice Test 1. You may take just Mechanics or just Electricity and Magnetism, or both. If you take both, you will receive a separate grade for each. 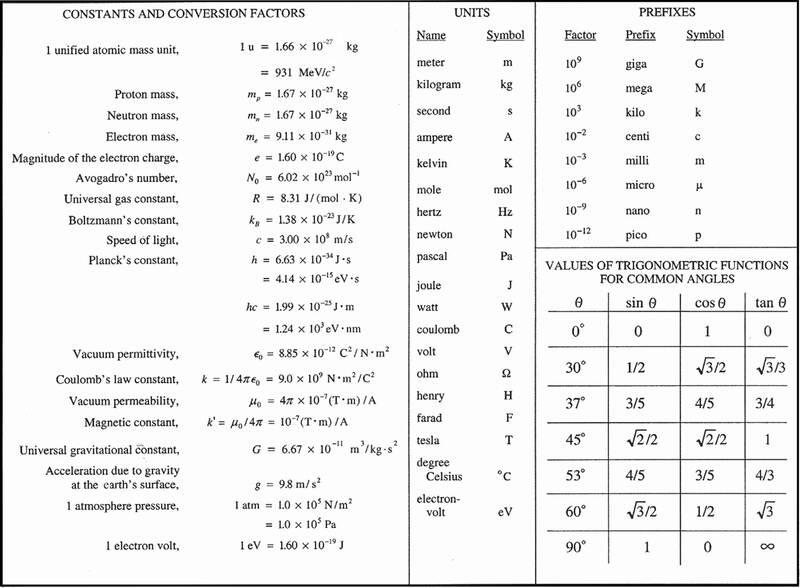 Each section of each examination is 50 percent of the total grade; each question in a section has equal weight. 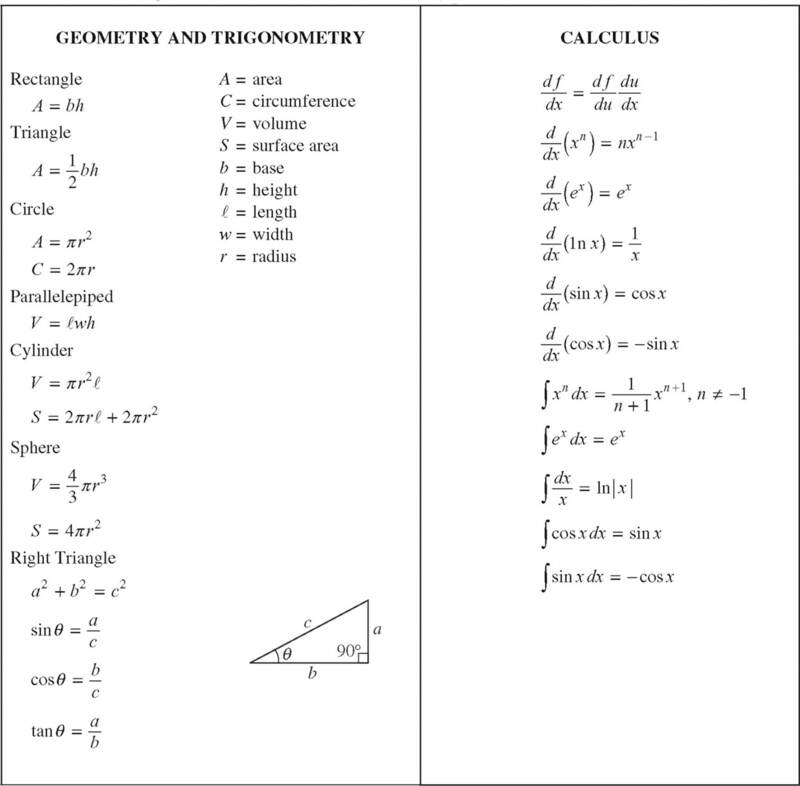 Calculators are NOT permitted on the multiple-choice section of the exam but are allowed on the free-response section. However, calculators cannot be shared with other students and calculators with typewriter-style (QWERTY) keyboards will not be permitted. 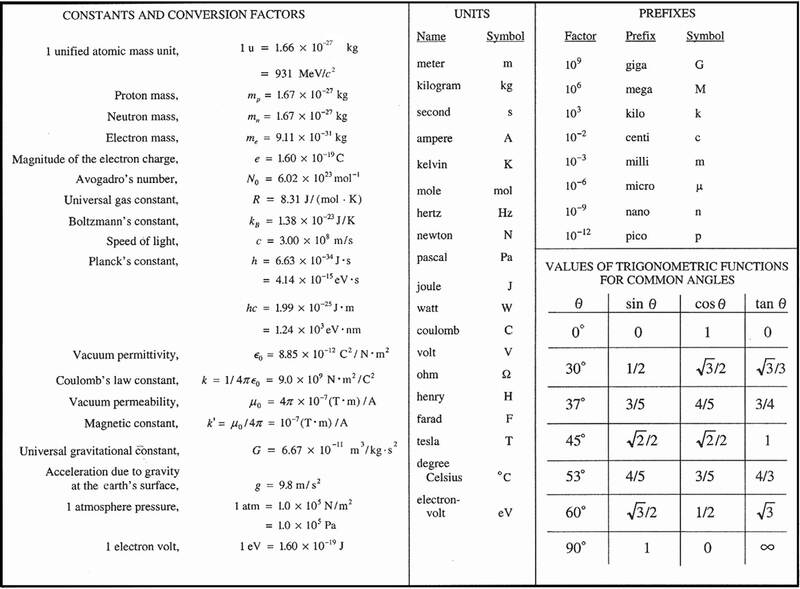 On the following pages you will find the Table of Information that is provided to you during the exam. 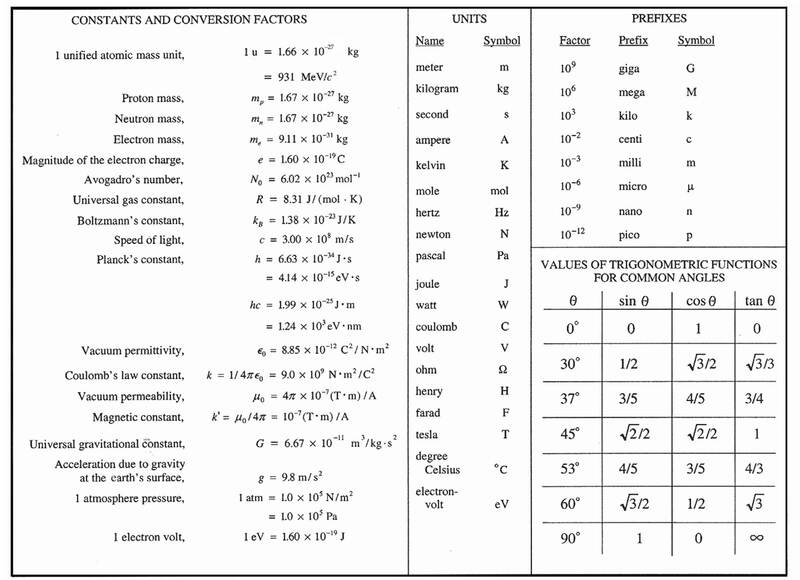 — the entire examination (Mechanics and Electricity and Magnetism), answer numbers 1–70 on your answer sheet. The following conventions are used in this examination. I. Unless otherwise stated, the frame of reference of any problem is assumed to be inertial. II. The direction of any electric current is the direction of flow of positive charge (conventional current). III. For any isolated electric charge, the electric potential is defined as zero at an infinite distance from the charge. Directions: Each of the questions or incomplete statements below is followed by five suggested answers or completions. Select the one that is best in each case and then mark it on your answer sheet. 2. A box of mass m slides on a horizontal surface with initial speed v0. It feels no forces other than gravity and the force from the surface. If the coefficient of kinetic friction between the box and the surface is µ, how far does the box slide before coming to rest? 3. 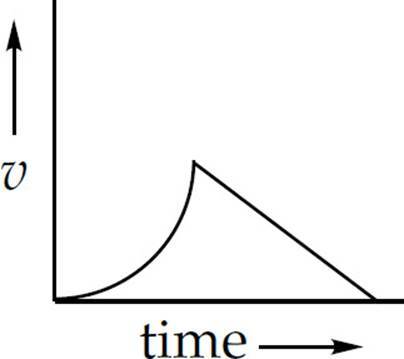 An object initially at rest experiences a time-varying acceleration given by a = (2 m/s3)t for t ≥ 0. How far does the object travel in the first 3 seconds? 4. Which of the following conditions will ensure that angular momentum is conserved? 5. 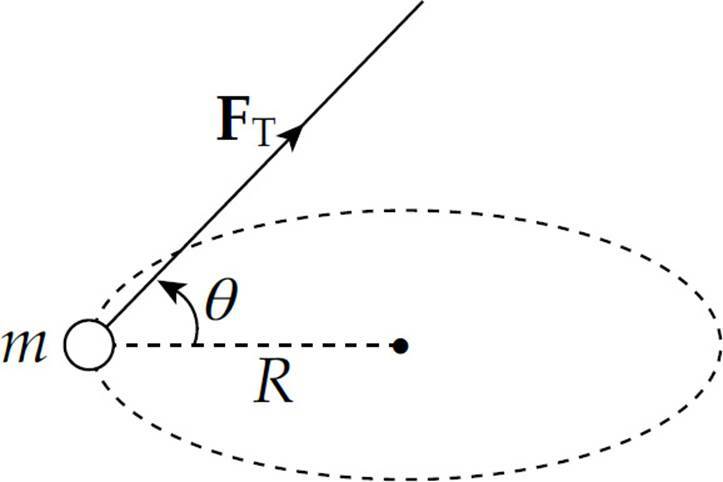 In the figure shown, a tension force FT causes a particle of mass m to move with constant angular speed ω in a circular path (perpendicular to the page) of radius R. Which of the following expressions gives the magnitude of FT? 6. An object (mass = m) above the surface of the Moon (mass = M) is dropped from an altitude h equal to the Moon’s radius (R). With what speed will the object strike the lunar surface? 7. The figure above shows a linear spring anchored to the ceiling. 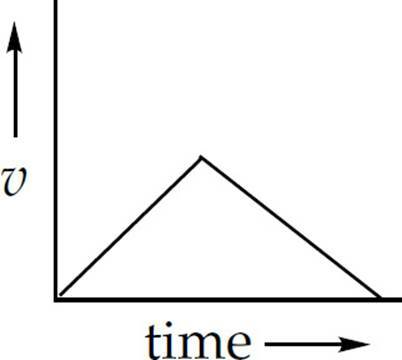 If the mass of the block hanging from its lower end is doubled, what effect will this change have on the block’s equilibrium position and oscillation period? 8. A uniform cylinder of mass m and radius r unrolls without slipping from two strings tied to a vertical support. If the rotational inertia of the cylinder is mr2, find the acceleration of its center of mass. 9. 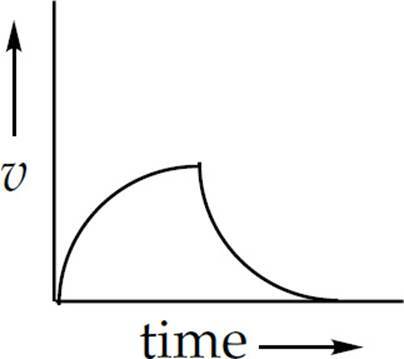 A uniform cylinder, initially at rest on a frictionless, horizontal surface, is pulled by a constant force F from time t = 0 to time t = T. From time t = T on, this force is removed. Which of the following graphs best illustrates the speed, v, of the cylinder’s center of mass from t = 0 to t = 2T? 10. An engine provides 10 kW of power to lift a heavy load at constant velocity a distance of 20 m in 5 s. What is the mass of the object being lifted? 11. A satellite is in circular orbit around Earth. If the work required to lift the satellite to its orbit height is equal to the satellite’s kinetic energy while in this orbit, how high above the surface of Earth (radius = R) is the satellite? 12. The figure above shows a uniform bar of mass M resting on two supports. A block of mass M is placed on the bar twice as far from Support 2 as from Support 1. If F1 and F2 denote the downward forces on Support 1 and Support 2, respectively, what is the value of F2/F1? 13. A rubber ball (mass = 0.08 kg) is dropped from a height of 3.2 m, and after bouncing off the floor, rises almost to its original height. If the impact time with the floor is measured to be 0.04 s, what average force did the floor exert on the ball? 14. A disk of radius 0.1 m initially at rest undergoes an angular acceleration of 2.0 rad/s2. If the disk only rotates, find the total distance traveled by a point on the rim of the disk in 4.0 s.
15. 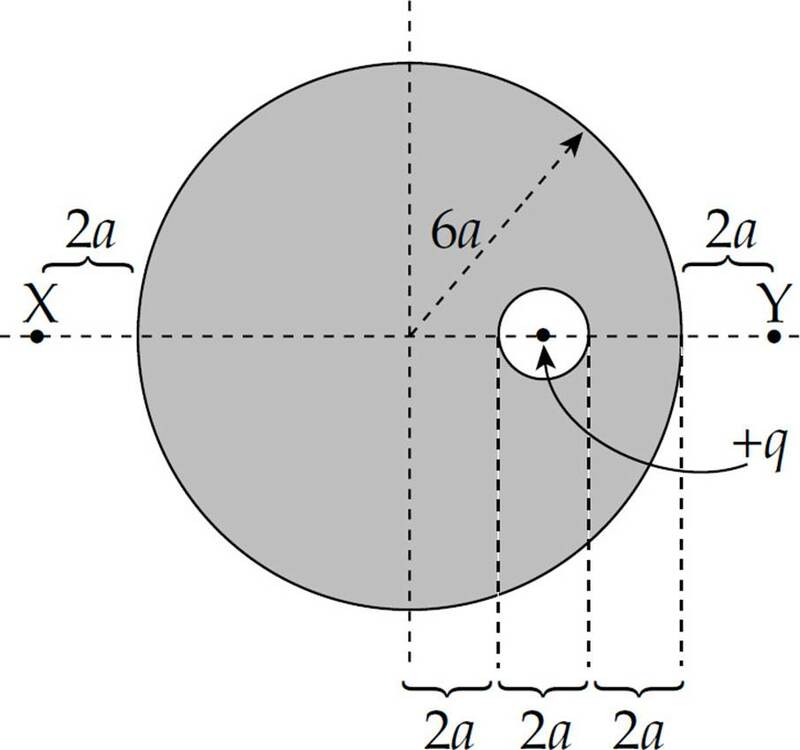 In the figure above, a small ball slides down a frictionless quarter-circular slide of radius R. If the ball starts from rest at a height equal to 2R above a horizontal surface, find its horizontal displacement, x, at the moment it strikes the surface. 16. 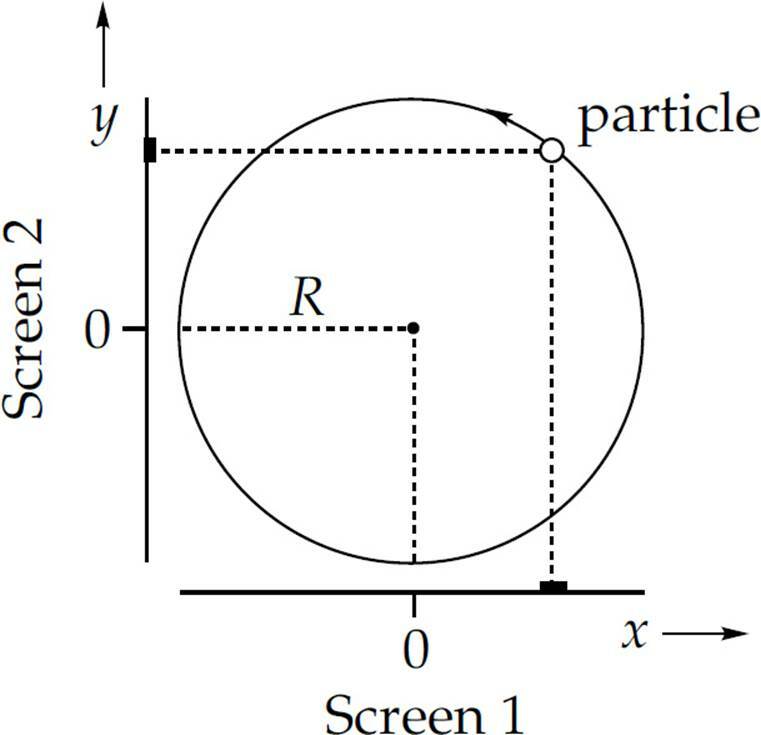 The figure above shows a particle executing uniform circular motion in a circle of radius R. Light sources (not shown) cause shadows of the particle to be projected onto two mutually perpendicular screens. The positive directions for x and y along the screens are denoted by the arrows. When the shadow on Screen 1 is at position x= –(0.5)R and moving in the +x direction, what is true about the position and velocity of the shadow on Screen 2 at that same instant? 17. 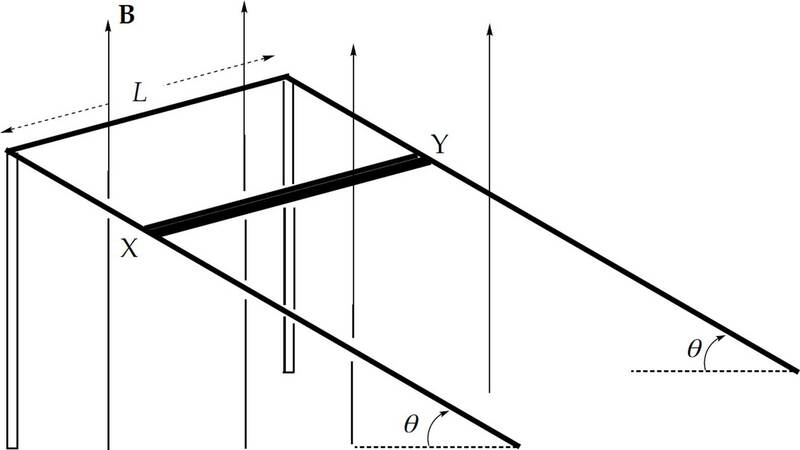 The figure shows a view from above of two objects attached to the end of a rigid massless rod at rest on a frictionless table. When a force F is applied as shown, the resulting rotational acceleration of the rod about its center of mass is kF/(mL). What is k? 18. A lightweight toy car crashes head-on into a heavier toy truck. Which of the following statements is true as a result of the collision? I. The car will experience a greater impulse than the truck. II. The car will experience a greater change in momentum than the truck. III. The magnitude of the acceleration experienced by the car will be greater than that experienced by the truck. 19. A homogeneous bar is lying on a flat table. Besides the gravitational and normal forces (which cancel), the bar is acted upon by exactly two other external forces, F1 and F2, which are parallel to the surface of the table. If the net force on the rod is zero, which one of the following is also true? (A) The net torque on the bar must also be zero. 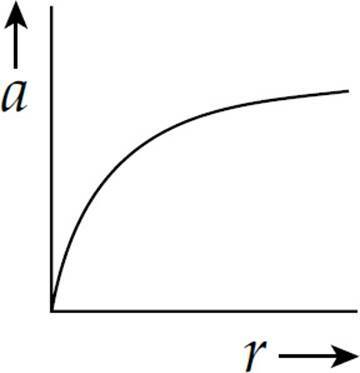 (B) The bar cannot accelerate translationally or rotationally. (C) The bar can accelerate translationally if F1 and F2 are not applied at the same point. (D) The net torque will be zero if F1 and F2 are applied at the same point. 20. An astronaut lands on a planet whose mass and radius are each twice that of Earth. If the astronaut weighs 800 N on Earth, how much will he weigh on this planet? 21. A particle of mass m = 1.0 kg is acted upon by a variable force, F(x), whose strength is given by the graph given above. If the particle’s speed was zero at x = 0, what is its speed at x = 4 m? 22. The radius of a collapsing spinning star (assumed to be a uniform sphere) decreases to its initial value. What is the ratio of the final rotational kinetic energy to the initial rotational kinetic energy? 23. 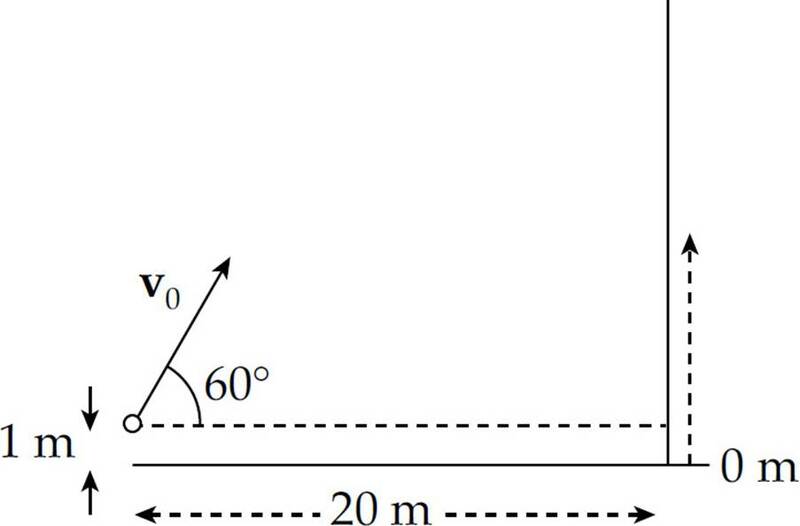 A ball is projected with an initial velocity of magnitude v0 = 40 m/s toward a vertical wall as shown in the figure above. How long does the ball take to reach the wall? 24. 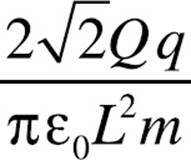 If L, M, and T denote the dimensions of length, mass, and time, respectively, what are the dimensions of impulse? 25. 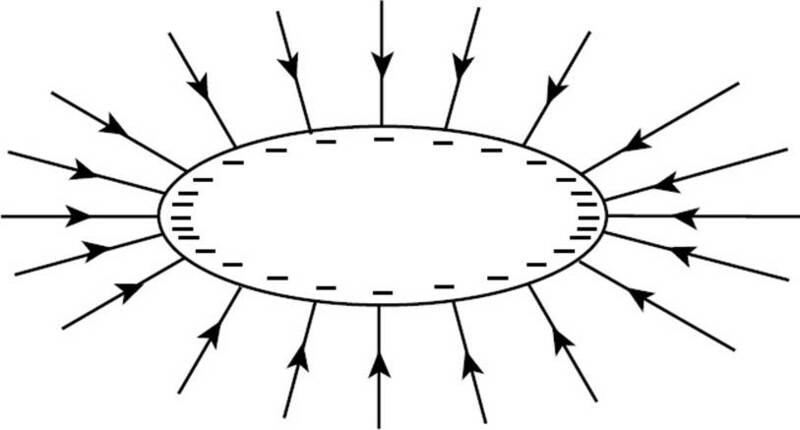 The figure shown is a view from above of two clay balls moving toward each other on a frictionless surface. 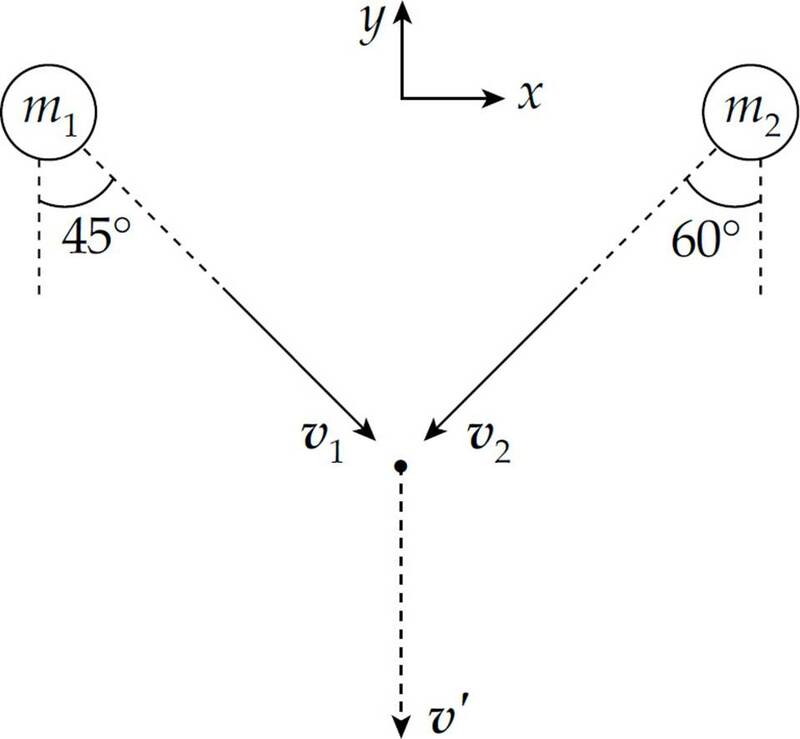 They collide perfectly inelastically at the indicated point and are observed to then move in the direction indicated by the post-collision velocity vector, v’. If m1 = 2m2 what is v2? 26. In the figure above, the coefficient of static friction between the two blocks is 0.80. If the blocks oscillate with a frequency of 2.0 Hz, what is the maximum amplitude of the oscillations if the small block is not to slip on the large block? 27. 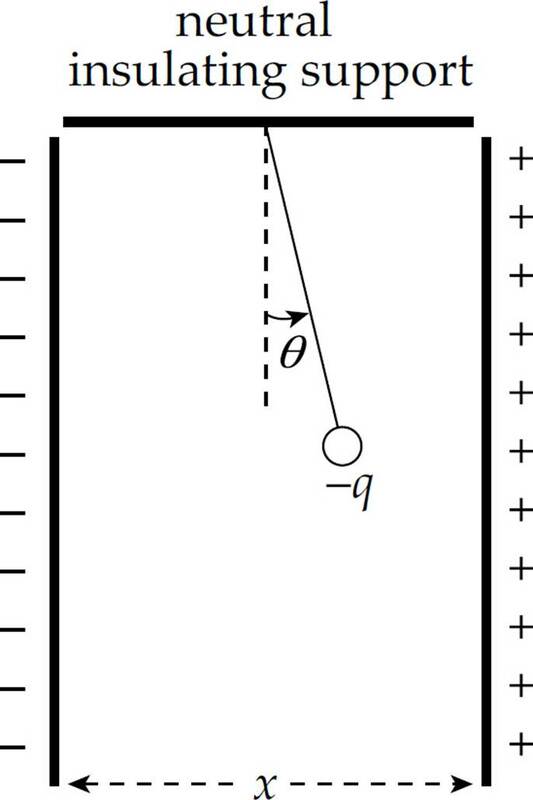 When two objects collide, the ratio of the relative speed after the collision to the relative speed before the collision is called the coefficient of restitution, e. If a ball is dropped from height H1 onto a stationary floor, and the ball rebounds to height H2, what is the coefficient of restitution of the collision? 28. 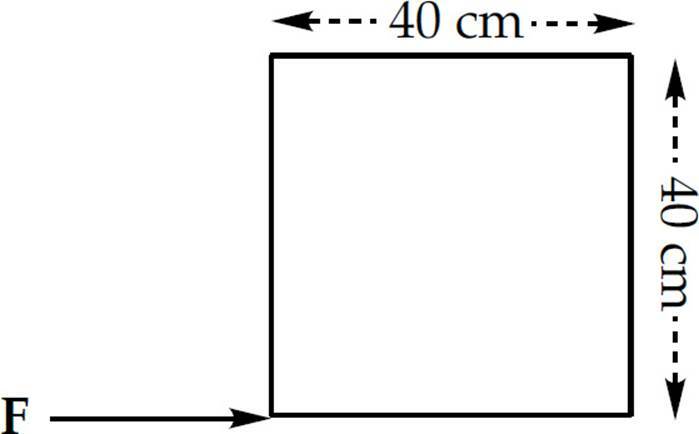 The figure above shows a square metal plate of side length 40 cm and uniform density, lying flat on a table. A force F of magnitude 10 N is applied at one of the corners, as shown. Determine the torque produced by F relative to the center of rotation. 29. 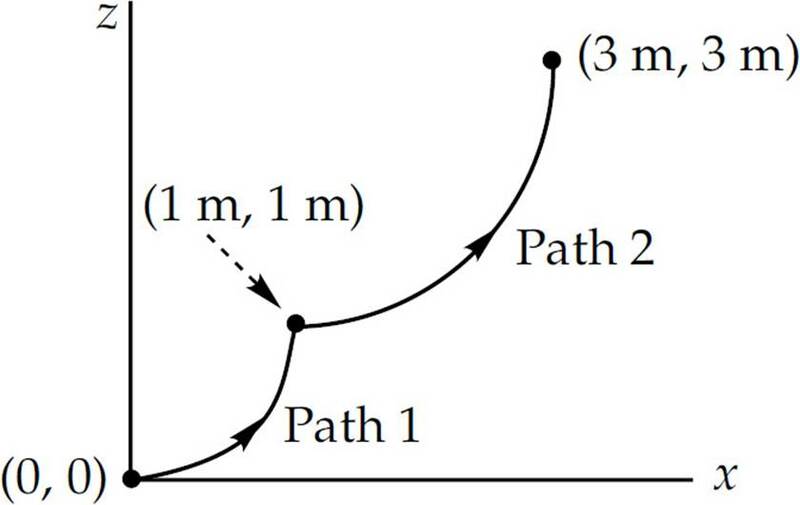 A small block of mass m = 2.0 kg is pushed from the initial point (xi, zi) = (0 m, 0 m) upward to the final point (xf, zf) = (3 m, 3 m) along the path indicated. Path 1 is a portion of the parabola z = x2, and Path 2 is a quarter circle whose equation is (x – 2)2 + (z – 2)2 = 2. How much work is done by gravity during this displacement? 30. 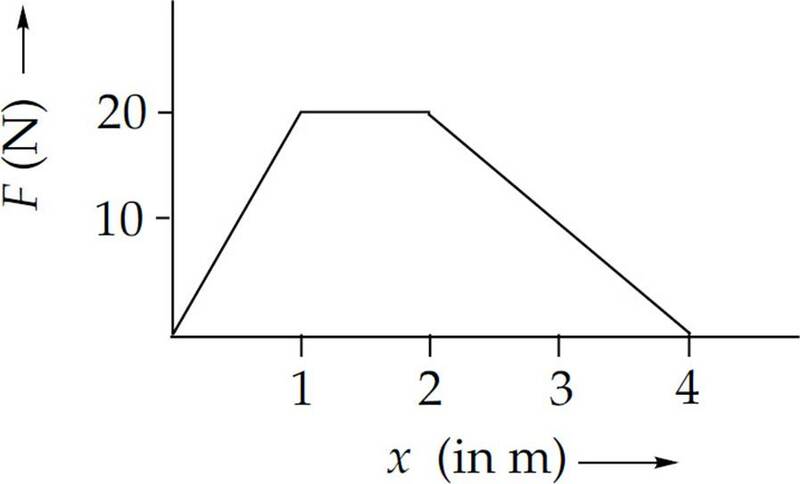 In the figure shown, the block (mass = m) is at rest at x = A. As it moves back toward the wall due to the force exerted by the stretched spring, it is also acted upon by a frictional force whose strength is given by the expression bx, where b is a positive constant. What is the block’s speed when it first passes through the equilibrium position (x = 0)? 31. 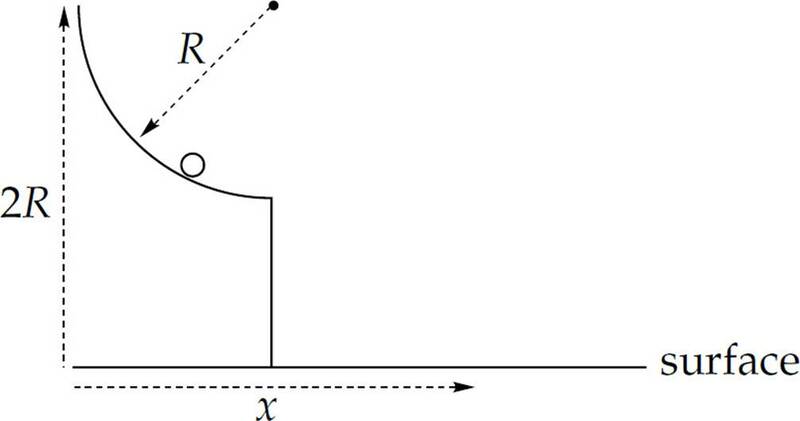 The rod shown above can pivot about the point x = 0 and rotates in a plane perpendicular to the page. Its linear density, λ, increases with x such that λ(x) = kx, where k is a positive constant. Determine the rod’s moment of inertia in terms of its length, L, and its total mass, M.
where U is given in joules when x is measured in meters. 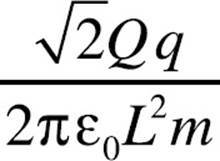 Which of the following represents a position of stable equilibrium? 33. 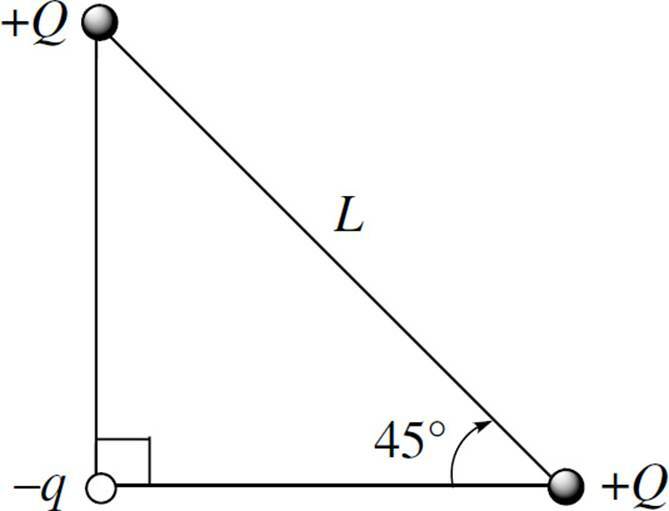 At what angle to the horizontal should an ideal projectile be launched so that its horizontal displacement (the range) is equal to its maximum vertical displacement? 34. A particle’s kinetic energy is changing at a rate of –6.0 J/s when its speed is 3.0 m/s. What is the magnitude of the force on the particle at this moment? 35. An object of mass 2 kg is acted upon by three external forces, each of magnitude 4 N. Which of the following could NOT be the resulting acceleration of the object? Directions: Answer all three questions. The suggested time is about 15 minutes per question for answering each of the questions, which are worth 15 points each. The parts within a question may not have equal weight. Mech 1. A massless, frictionless pulley is suspended from a rigid rod attached to the roof of an elevator car. 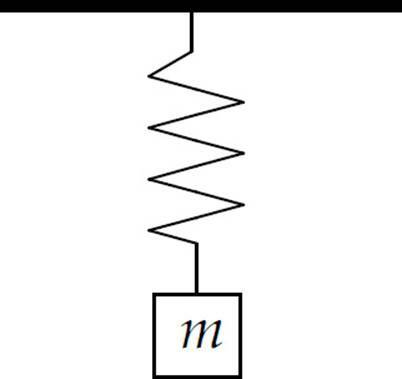 Two masses, m and M (with M > m), are suspended on either side of the pulley by a light, inextendable cord. The distance from the top of the elevator car to the center of mass of the pulley, yp, is fixed. (a) Assume that the elevator car is descending at constant velocity. 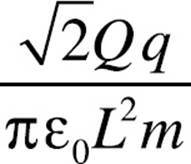 For each of the following, write your answer in terms of m, M, and g.
(i) Determine the accelerations of the masses. (ii) Find the tension in the cord. 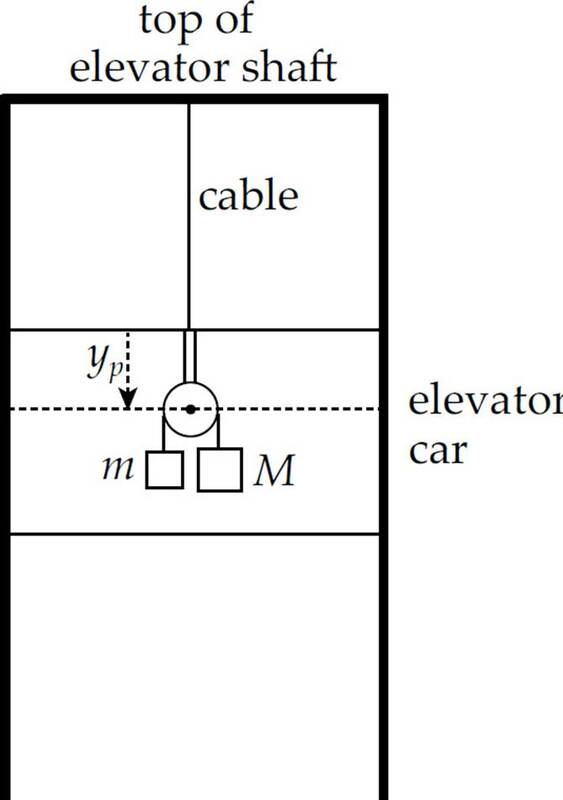 (b) Now assume that the elevator car is descending with a nonzero (but constant) acceleration, b. (i) State why the coordinate system that uses the center of the pulley as its origin is not an inertial reference system. For parts (ii) and (iii), use the top of the elevator shaft as a reference. Write your answers in terms of m, M, g, and b. (ii) Find the acceleration of the masses. (iii) Determine the tension in the cord. (iv) For what value of b would the answer to part (iii) be zero? Mech 2. A narrow tunnel is drilled through Earth (mass = M, radius = R), connecting points P and Q, as shown in the diagram on the left below. The perpendicular distance from Earth’s center, C, to the tunnel is x. 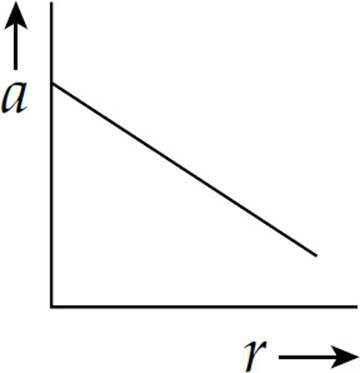 A package (mass = m) is dropped from Point P into the tunnel; its distance from P is denoted y and its distance from C is denoted r. See the diagram on the right. (b) Use the equation F(r) = –dU/dr to find an expression for the change in gravitational potential energy of the package as it moves from Point P to a point where its distance from Earth’s center is r. Write your answer in terms of G, M, m, R, and r.
(d) (i) At what point in the tunnel—that is, for what value of y—will the speed of the package be maximized? Mech 3. The diagram below is a view from above of three sticky hockey pucks on a frictionless horizontal surface. The pucks with masses m and 2m are connected by a massless rigid rod of length L and are initially at rest. The puck of mass 3m is moving with velocity v directly toward puck m. When puck 3m strikes puck m, the collision is perfectly inelastic. (i) where is the center of mass of the system? 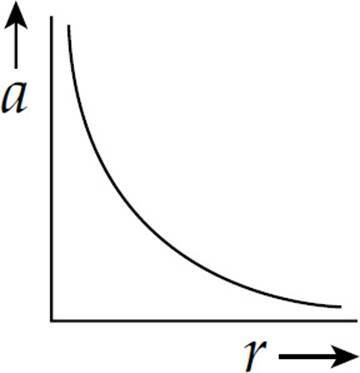 (b) What fraction of the system’s initial kinetic energy is lost as a result of the collision? Directions: Each of the questions or incomplete statements below is followed by five suggested answers or completions. Select the one that is best in each case and mark it on your answer sheet. 36. A nonconducting sphere is given a nonzero net electric charge, +Q, and then brought close to a neutral conducting sphere of the same radius. Which of the following will be true? 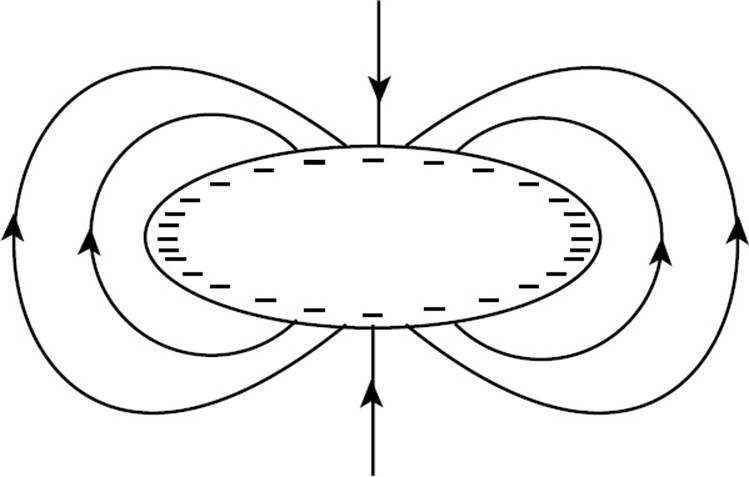 (A) An electric field will be induced within the conducting sphere. (B) The conducting sphere will develop a net electric charge of –Q. (C) The spheres will experience an electrostatic attraction. (D) The spheres will experience an electrostatic repulsion. (E) The spheres will experience no electrostatic interaction. 37. Which of the following would increase the capacitance of a parallel-plate capacitor? 38. 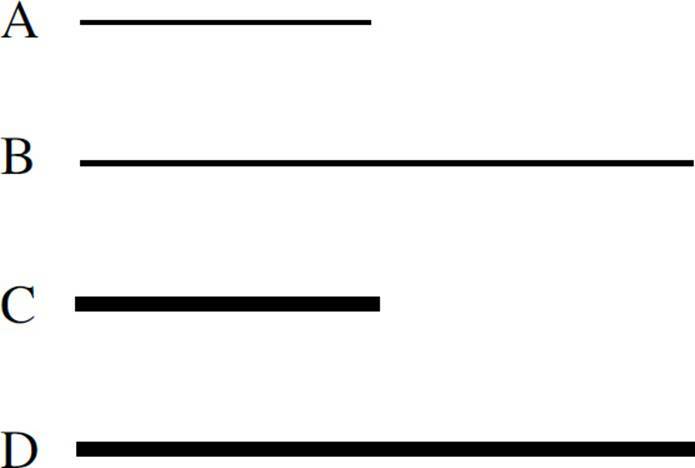 Each of the following ionized isotopes is projected with the same speed into a uniform magnetic field B such that the isotope’s initial velocity is perpendicular to B. 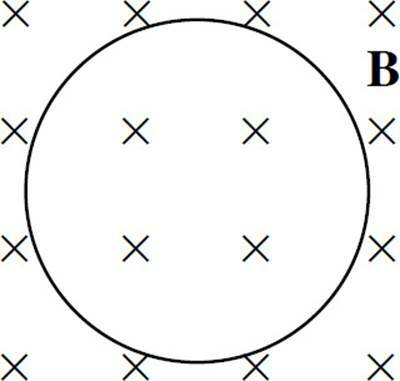 Which combination of mass and charge would result in a circular path with the largest radius? 39. 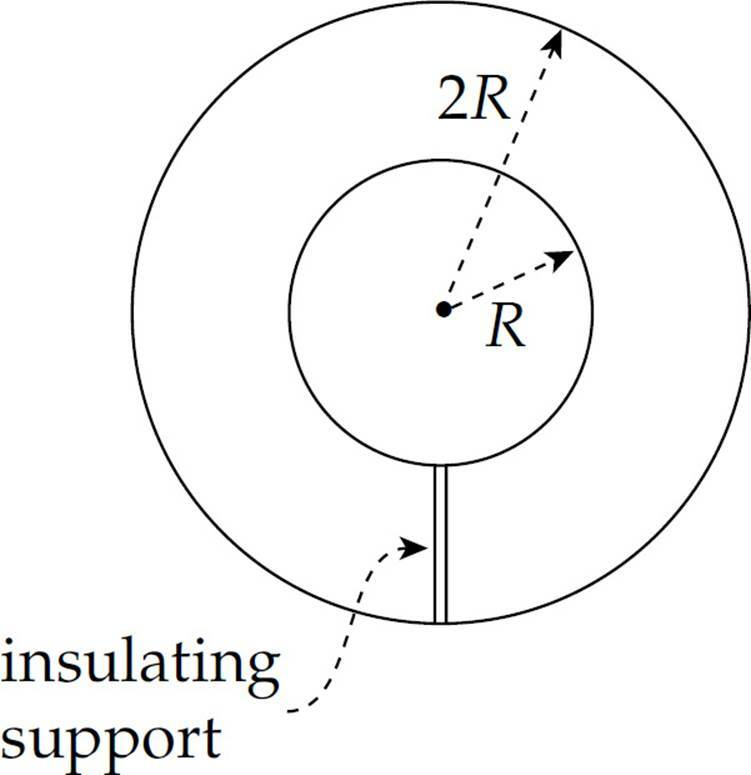 An ellipsoid-shaped conductor is negatively charged. Which one of the following diagrams best illustrates the charge distribution and electric field lines? 40. The four wires shown above are each made of aluminum. Which wire will have the greatest resistance? (E) All the wires have the same resistance, because they’re all composed of the same material. 41. Which of the following is NOT equal to one tesla? 42. The figure above shows two Gaussian surfaces: a cube with side length d and a sphere with diameter d. The net electric charge enclosed within each surface is the same, +Q. If ΦC denotes the total electric flux through the cubical surface, and ΦS denotes the total electric flux through the spherical surface, then which of the following is true? 43. 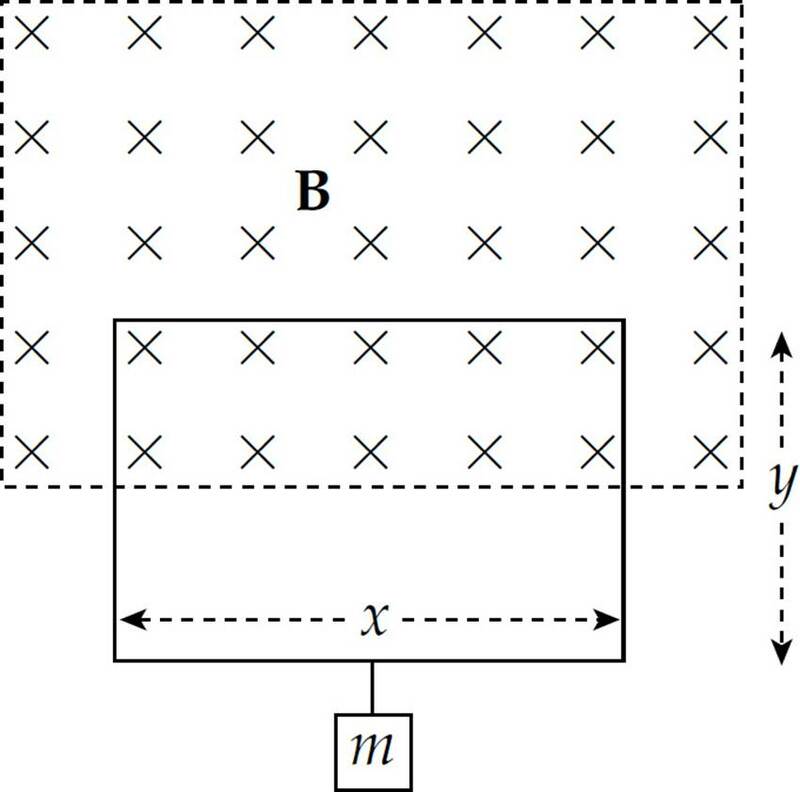 The figure above shows two large vertical conducting plates that carry equal but opposite charges. 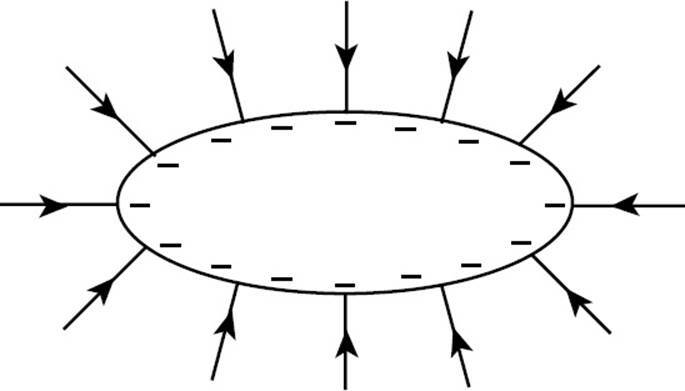 A ball of mass m and charge –q is suspended from a light string in the region between the plates. If the voltage between the plates is V, which of the following gives the angle θ? 44. An object carries a charge of –1 C. How many excess electrons does it contain? Each of the resistors shown in the circuit below has a resistance of 200 Ω. The emf of the ideal battery is 24 V.
45. How much current is provided by the source? 46. What is the ratio of the power dissipated by R1 to the power dissipated by R4? 47. What is the value of the following product? where B is given in teslas when t is measured in seconds. What is the magnitude of the induced electric field in the wire at time t = 1 s? 49. In the figure above, the top half of a rectangular loop of wire, x meters by y meters, hangs vertically in a uniform magnetic field, B. 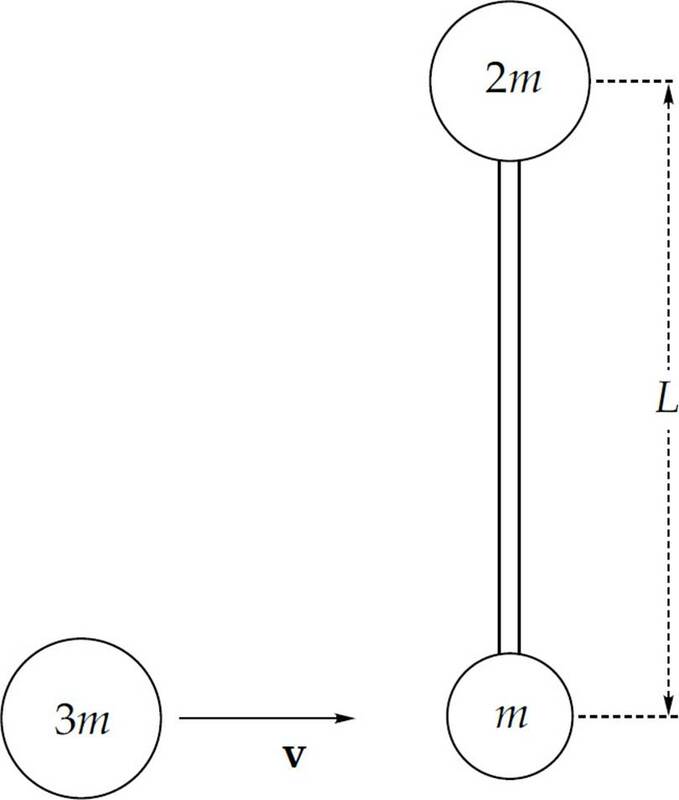 Describe the magnitude and direction of the current in the loop necessary for the magnetic force to balance the weight of the mass m supported by the loop. 50. 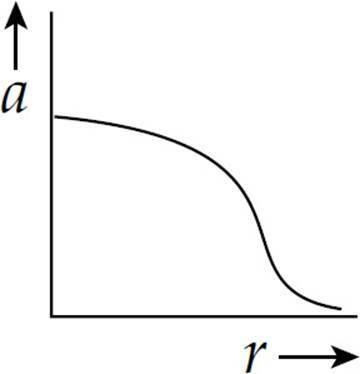 A solid nonconducting cylinder of radius R and length L contains a volume charge density given by the equation ρ(r) = (+3 C/m4)r, where r is the radial distance from the cylinder’s central axis. This means that the total charge contained within a concentric cylinder of radius r < R and length ℓ < L is equal to 2πℓr3. Find an expression for the strength of the electric field inside this cylinder. 51. 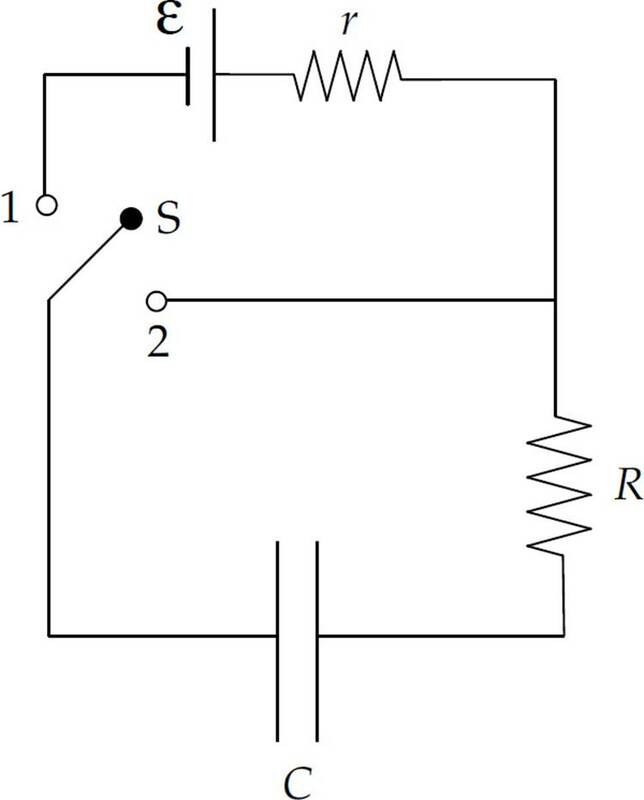 The figure above shows a pair of long, straight current-carrying wires and four marked points. 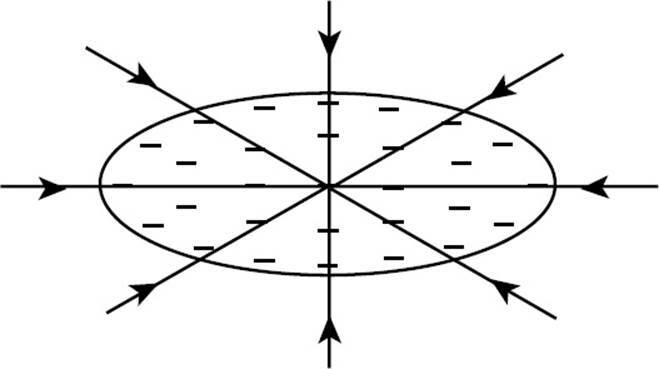 At which of these points is the net magnetic field zero? 52. The figure above shows two positively charged particles. The +Q charge is fixed in position, and the +q charge is brought close to +Q and released from rest. 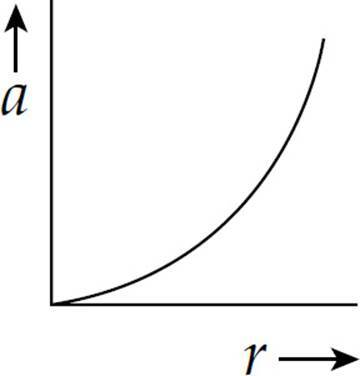 Which of the following graphs best depicts the acceleration of the +q charge as a function of its distance r from +Q? 53. 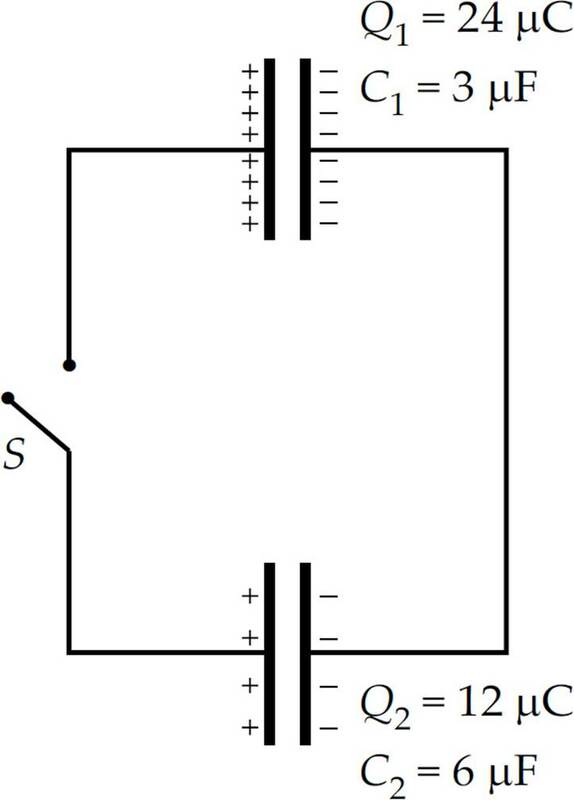 Once the switch S in the figure above is closed and electrostatic equilibrium is regained, how much charge will be stored on the positive plate of the 6 µF capacitor? 54. 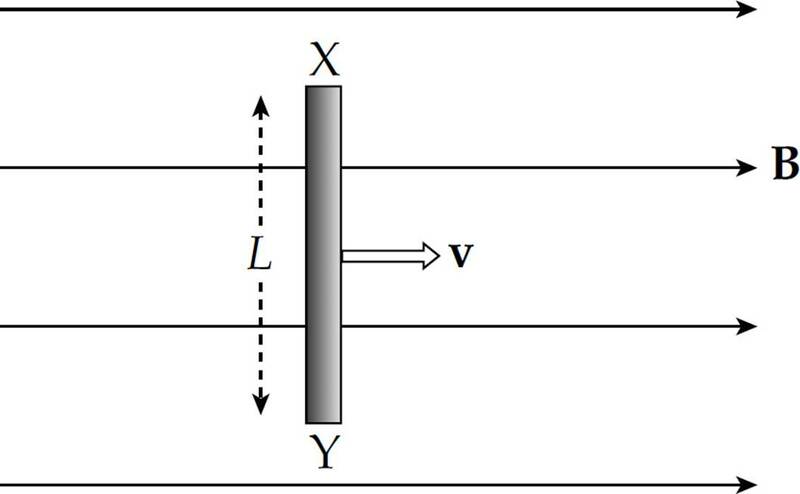 A metal bar of length L is pulled with velocity v through a uniform magnetic field, B, as shown above. What is the voltage produced between the ends of the bar? 55. An electric dipole consists of a pair of equal but opposite point charges of magnitude 4.0 nC separated by a distance of 2.0 cm. What is the electric field strength at the point midway between the charges? 56. 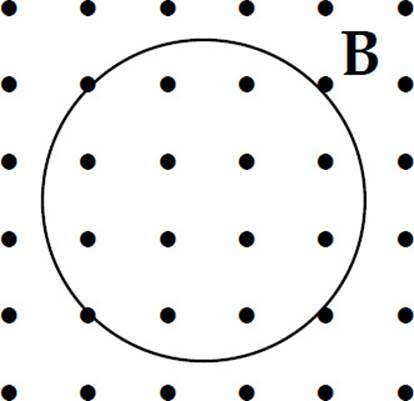 The figure above shows a cross section of two concentric spherical metal shells of radii R and 2R, respectively. Find the capacitance. 57. Traveling at an initial speed of 1.5 × 106 m/s, a proton enters a region of constant magnetic field, B, of magnitude 1.0 T. If the proton’s initial velocity vector makes an angle of 30° with the direction of B, compute the proton’s speed 4 s after entering the magnetic field. 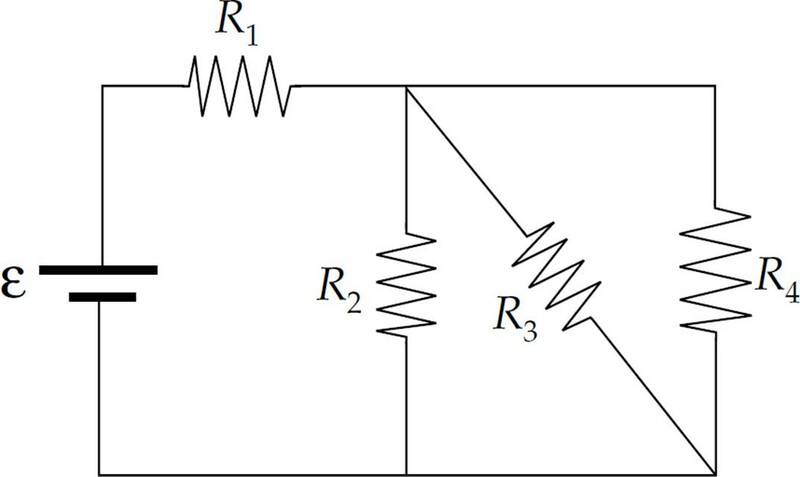 There is initially no current through any circuit element in the following diagram. 58. 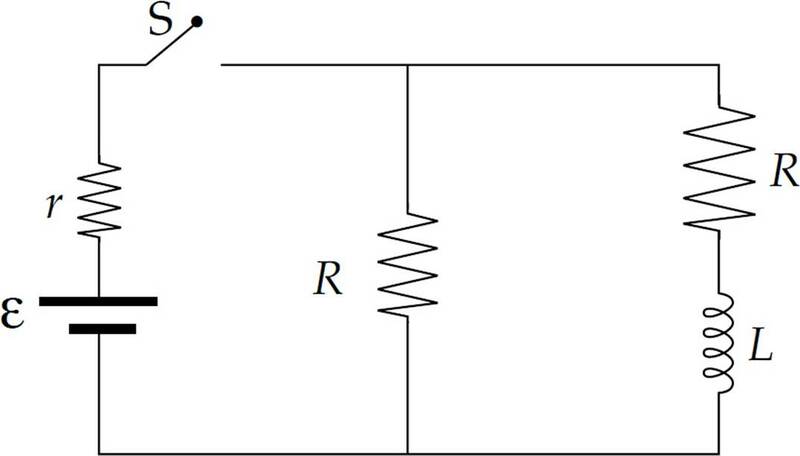 What is the current through r immediately after the switch S is closed? 59. After the switch has been kept closed for a long time, how much energy is stored in the inductor? 60. After having been closed for a long time, the switch is suddenly opened. What is the current through r immediately after S is opened? 61. A solid, neutral metal sphere of radius 6a contains a small cavity, a spherical hole of radius a as shown above. Within this cavity is a charge, +q. If EX and EY denote the strength of the electric field at points X and Y respectively, which of the following is true? 62. 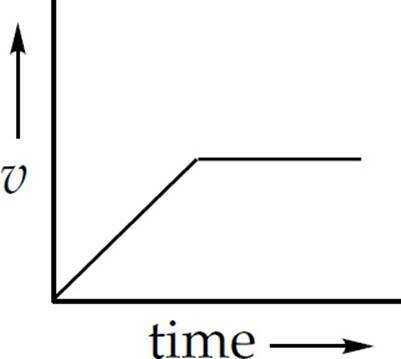 Two particles of charge +Q are located on the x-axis, as shown above. 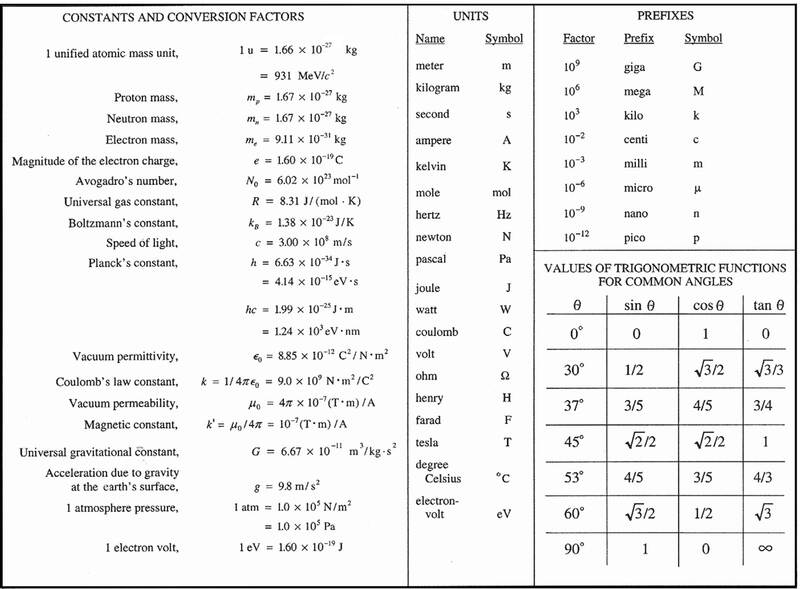 Determine the work done by the electric field to move a particle of charge –Q from very far away to point P.
63. A battery is connected in series with a switch, a resistor of resistance R, and an inductor of inductance L. Initially, there is no current in the circuit. Once the switch is closed and the circuit is completed, how long will it take for the current to reach 99% of its maximum value? 64. What is the maximum number of 40 W light bulbs that could be connected in parallel with a 120 V source? The total current cannot exceed 5 A or the circuit will blow a fuse. 66. A dielectric of thickness is placed between the plates of a parallel-plate capacitor, as shown above. If K is the dielectric constant of the slab, what is the capacitance? 67. Consider the two source charges shown above. 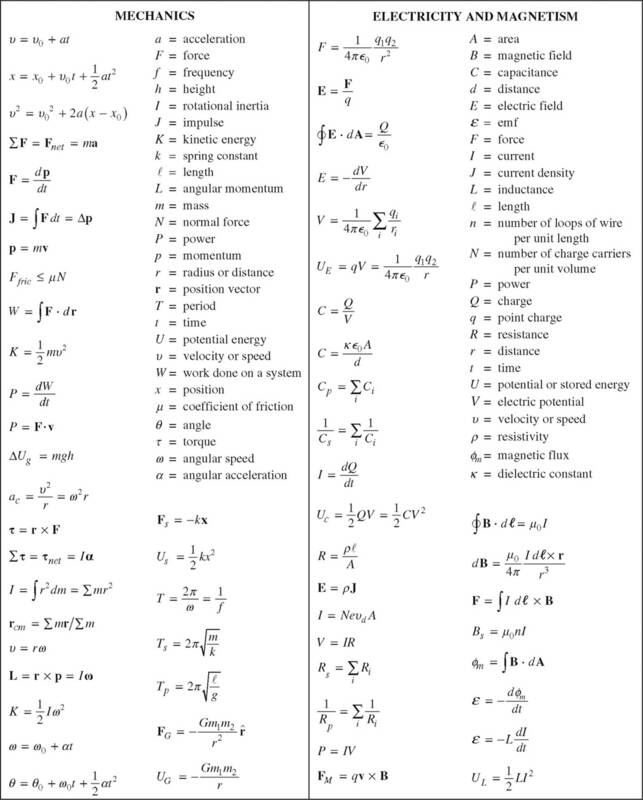 At how many points in the plane of the page, in a region around these charges are both the electric field and the electric potential equal to zero? where the integral is taken around WXYZ? 69. 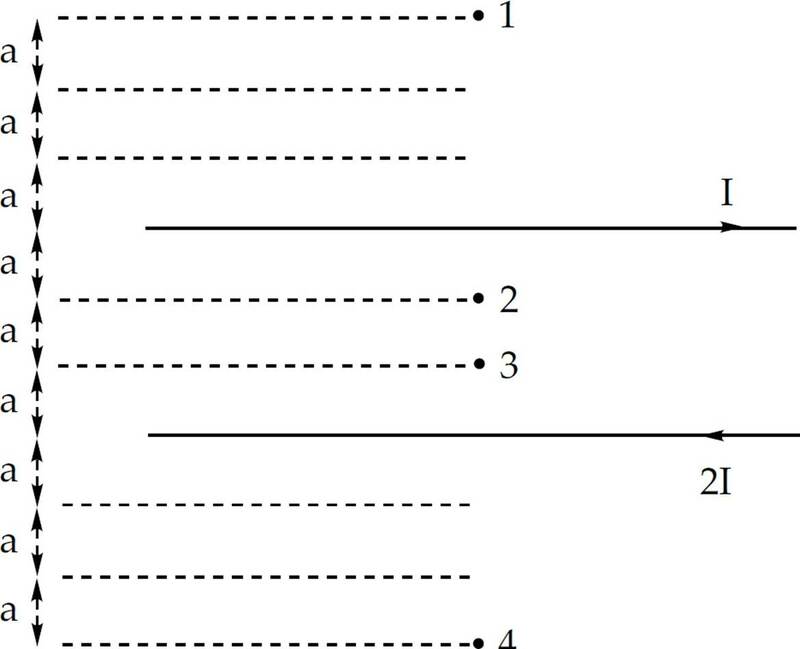 The positions of two isolated point charges, +Q and –Q, are fixed as shown in the figure above. Which of the following statements is/are true? I. A charge +q moving along line ℓ would experience no change in electrical potential energy. II. There is exactly one point on line ℓ where the total electrostatic force on +q is equal to zero. III. 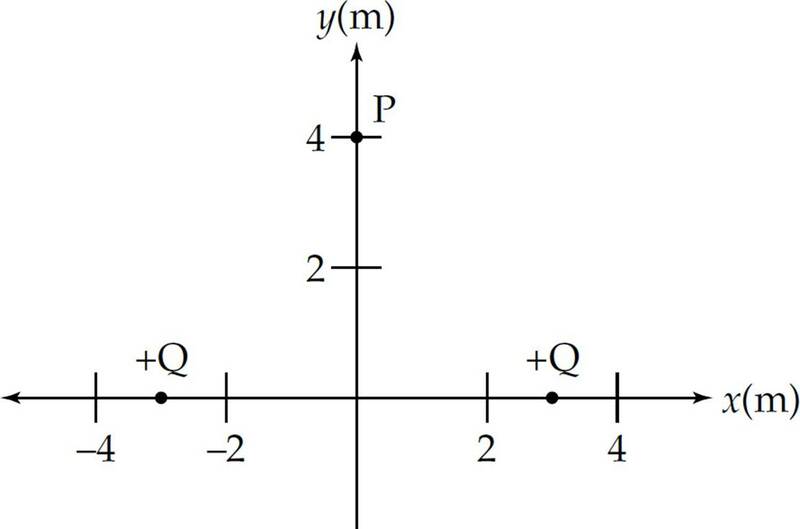 At any point P on line ℓ, the intersection of the equipotential surface containing P with the plane of the figure is an ellipse with the charges +Q and –Q at the foci. 70. Two point charges, each +Q, are fixed a distance L apart. 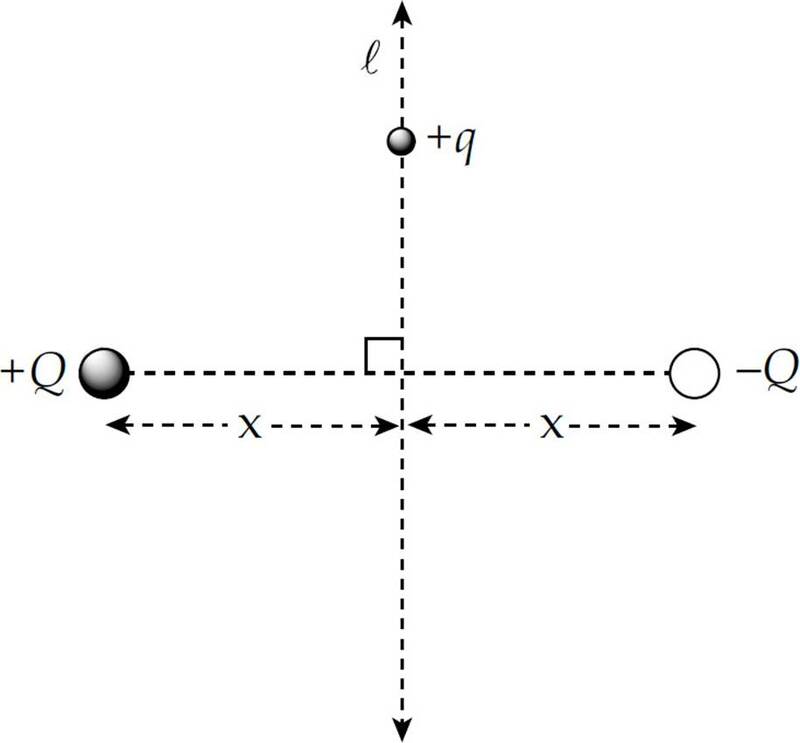 A particle of charge –q and mass m is placed as shown in the figure above. What is this particle’s initial acceleration when released from rest? E & M 1. 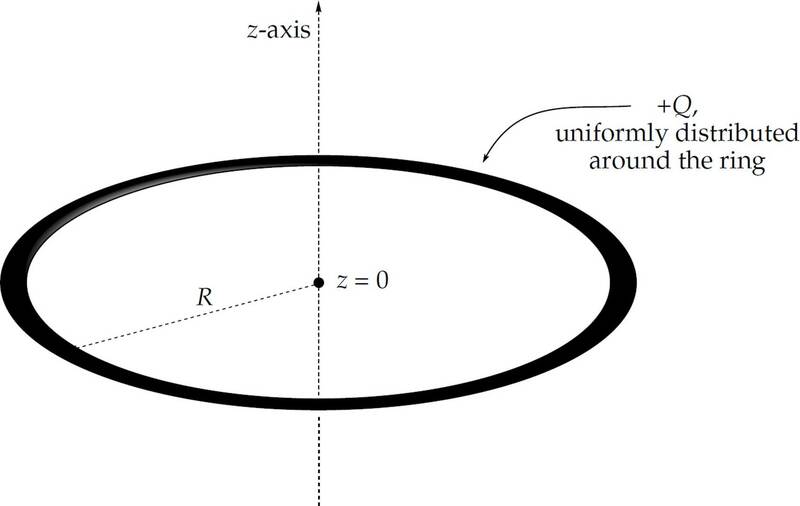 A uniformly charged, nonconducting, circular ring of radius R carries a charge +Q. Its central axis is labeled the z-axis, and the center of the ring is z = 0. 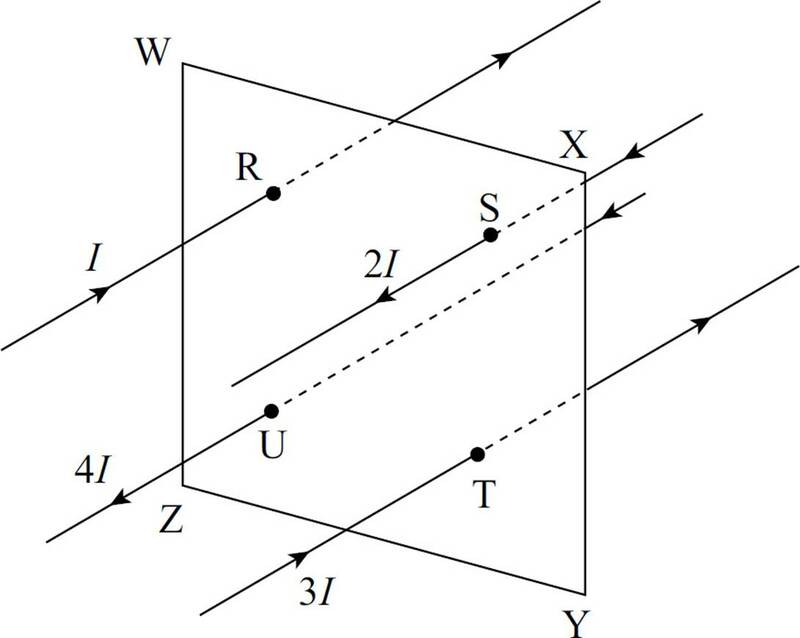 Points above the ring on the z-axis have positive z coordinates; those below have negative z coordinates. (a) Calculate the electric potential at an arbitrary point on the z-axis. Write your answer in terms of Q, z, R, and fundamental constants. 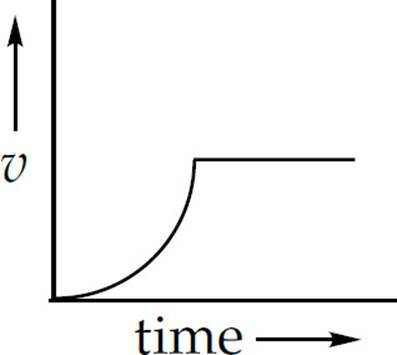 (b) (i) At what point(s) on the z-axis will the potential have its greatest value? (ii) What is this maximum potential value? (c) Find an expression for the electric field (magnitude and direction) at an arbitrary point on the z-axis. Write your answer in terms of Q, z, R, and fundamental constants. (d) A positive charge is released from rest at z = +2R on the z-axis. Describe the subsequent motion of the positive charge. Justify your answer. E & M 2. In the circuit shown below, the capacitor is initially uncharged and there is no current in any circuit element. In each of the following, k is a number greater than 1; write each of your answers in terms of ε, r, R, C, k, and fundamental constants. (a) At t = 0, the switch S is moved to position 1. (i) At what time t is the current through R equal to of its initial value? (ii) At what time t is the charge on the capacitor equal to of its maximum value? (iii) At what time t is the energy stored in the capacitor equal to of its maximum value? (b) After the switch has been at position 1 for a very long time, it is then moved to position 2. Let this redefine t = 0 for purposes of the following questions. (i) How long will it take for the current through R to equal of its initial value? (ii) At what time t is the charge on the capacitor equal to of its initial value? E & M 3. 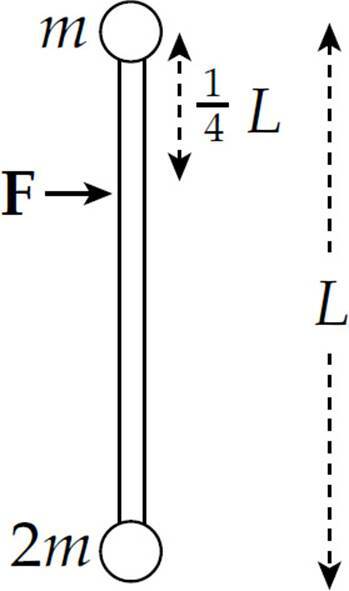 The following diagram shows two parallel conducting rails connected by a third rail of length L, raised to an angle of θ with the horizontal (supported by a pair of insulating columns). A metal strip of length L, mass m, and resistance R is free to slide without friction down the rails. The apparatus is immersed in a vertical, uniform magnetic field, B. The resistance of the stationary rails may be neglected. (ii) the direction of the induced current in the strip (X to Y, or Y to X?). (b) The strip XY will eventually slide down the rails at a constant velocity. Derive an expression for this velocity in terms of L, B, R, m, g, and θ. (c) When the strip is sliding with the constant velocity determined in part (b), show that the power dissipation in the strip is equal to the rate at which gravity is doing work on the strip.